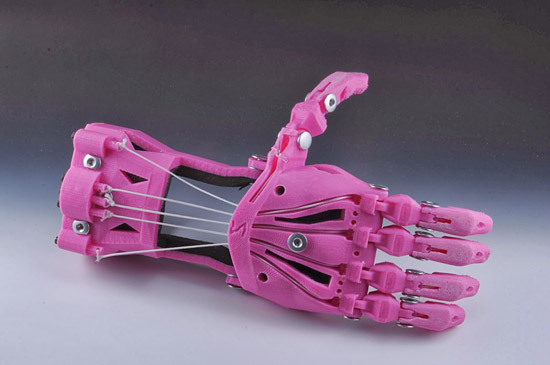 About eight months ago I mentioned the Robohand project, and said that 3D printers could change the world for the better, and not just be a way for people to make guns. The future is now! No, really, it is! It’s February 2014, and through a series of events involving the group E-Nable (also see Google+ and Facebook) I had a small part to play in helping a Milwaukee-area girl get a prosthetic hand. Nick from E-Nable contacted me because I’m a “3D printing guy” in Milwaukee, and asked for my help. I ended up asking everyone at Milwaukee Makerspace, and while many members jumped in to offer help (either with printing, or donating cash, or both) our pal Frankie Flood at UWM’s Digital Craft Research Lab took the project and ran with it. And yeah, he’s the best guy I know to take a project and run with it. The results have been amazing. Shea just got the first version of her new hand. She met with Frankie at his studio to have a mold made of her hand, and to meet with Frankie and his colleague Adream and discuss the process. Frankie then spent a lot of time with other of the E-Nable members trading files, tweaking files, printing a lot of parts, and coming up with new ideas on how to design and assemble a prosthetic hand. It’s been amazing to watch it all unfold. You can get a taste of it by checking the out the prosthetic category on Frankie’s blog. The next time someone asks you what you can do with a 3D printer, just casually mention that you can change someone’s life for the better. Posted on Wednesday, February 12th, 2014 at 1:03 pm. Subscribe to the comments feed. Both comments and pings are currently closed. Post on your own blog. Love the post, Pete. Thanks again for getting this ball rolling! Just glad I could make the connection this time. Hopefully I can be a bit more involved in the future!